What a difference….Thanks to my worst ever running race experience and result on the back of my best running experience at Maui half marathon I now have an ever growing prescription list. Now its inhale, sniff & swallow my variety of medications morning & night. 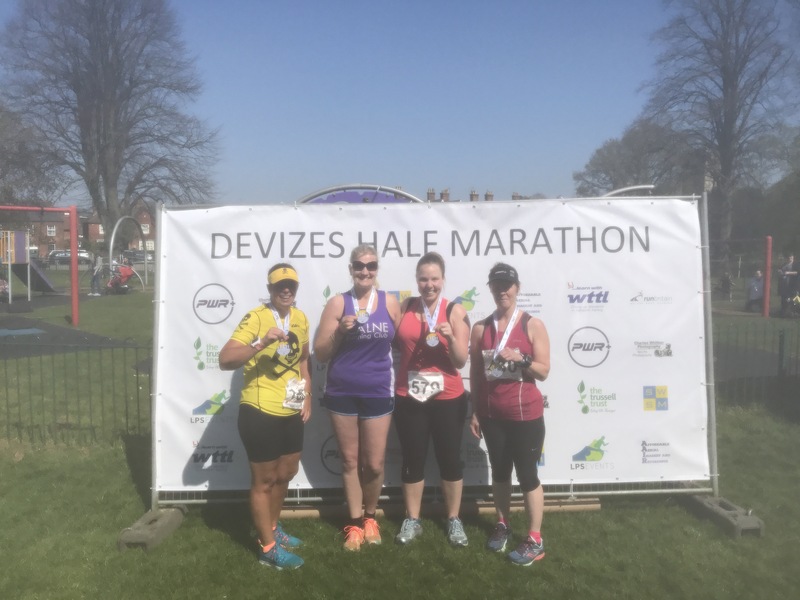 The race report of a sort is for Devizes half marathon, this is a local event to me and one I did on its first running a few year back then in October. As a local event with approx 550 runner this is a great event for novices and is part of the Wiltshire road league for the speedy club types. 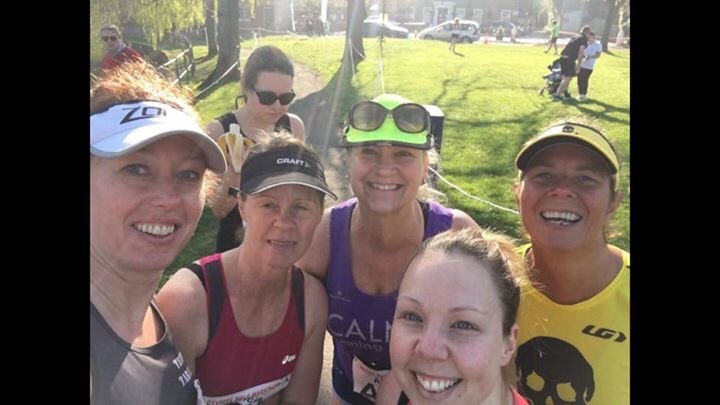 Communication from entry to the morning of the event was informative & comprehensive – course, parking, water stations, weather report, bag drops, massage, coffee, toilets, sponsors, pacers times and names, a text message with race number and social media snippets. On what was to be the hottest day of the year the club & charity vests & shorts were out, the thermal tights and jackets were left in the baggage truck. The smell of deep heat wasn’t lingering as we joined the start area. Pacers were visible in fluorescent orange t-shirts with pace printed on the back and waving a pace board aloft. The runners were relaxed and chatty as we made our way over the starting mats. Only myself and Digger representing the PSOF. Todays plan was to keep it in Zone2 nice and easy as a ‘training event’ and see where my fitness was post Hawaii holiday. Well based on the result I’m in serious trouble now 😢. Setting off with 2:15 wasn’t a great idea but I couldn’t push backwards in start pen any further. I kept pace with this group and a couple of friends for the first mile and a half. The route took us from the start at the Green and we were soon out in open countryside with the first two miles a nice 500m climb. 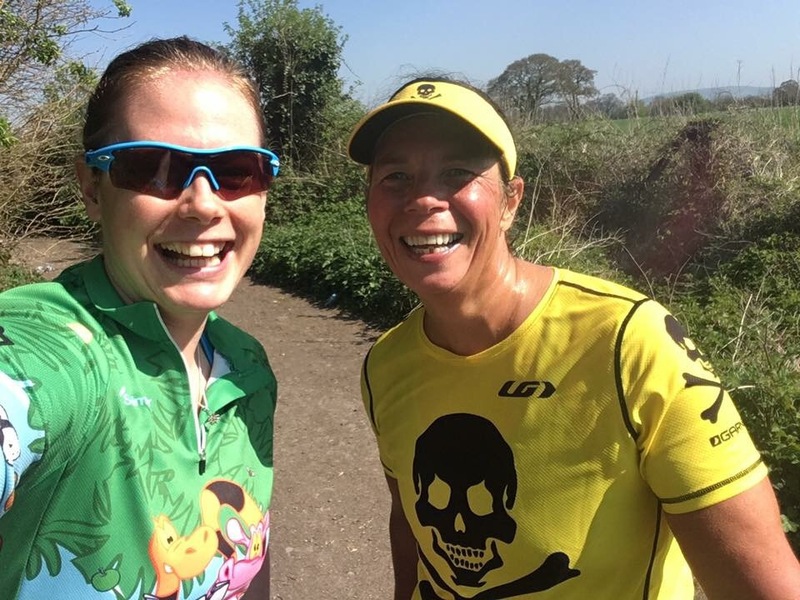 The route is stunning and many runners remarking on the beauty of the area as we spotted chalk white horses and a chalk whales due to a land slide on the grassy ridge. Around mile 5 environment & exercise started to affect me, my nose was streaming and the flow rate faster than my running pace, the recently ploughed fields were dry and dusty with the welcome breeze whipping up dust clouds which made my breathing wheezy. Out came my little blue friend – Ventoline for a couple of puffs, this slowed me down as I caught my breath, constantly cleared my nose and carried on. I made it to the half way point in a none impressive time of around an hour and ten minutes. I guzzled water and gorged on a few Jelly babies, they always make me feel better ! Caught my breath and allowed my soaring heart rate drop. So much for a Zone2 run I was well and truly entrenched in the mid Zone3 zone. Wasn’t too worried about high HR as it was a scorcher of a day, I’d taken extra Ventoline both of which are known to elevate the HR plus after the first climb the course continued to be undulating. My wheezy breathing & streaming nose were more of an annoyance & limiter. Stop or Go ? in my mind I only had 4 miles left ( note I was at the half way point of 13.1 miles). I decided it was just and extended Parkrun left so GO. 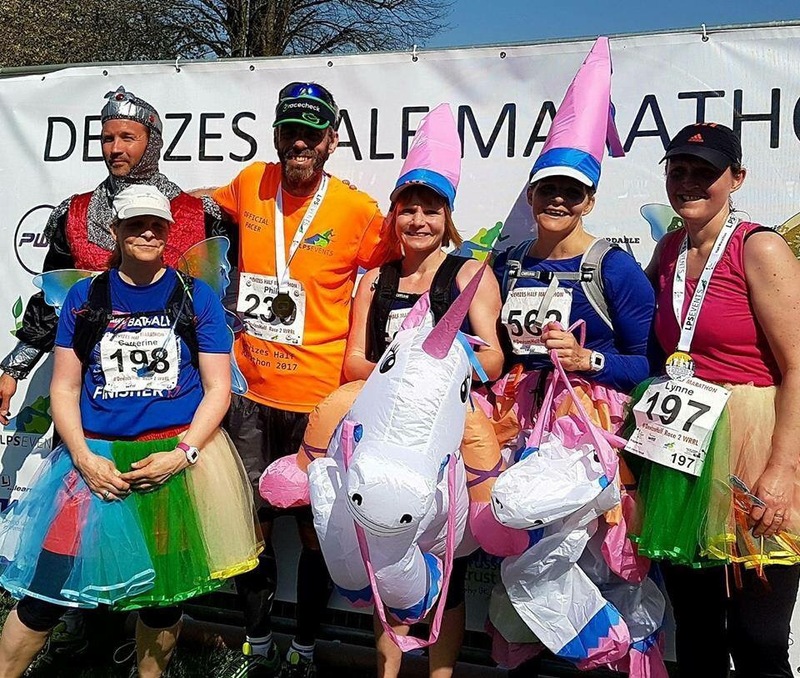 Maybe it was heat stroke that my brain went mush or the fact the three unicorns and a knight has just jogged past me sprinkling unicorn dazzle dust on me ?! After another cheeky climb and I came to mile 9 water station and met familiar faces as manned by Chippenham Harriers. 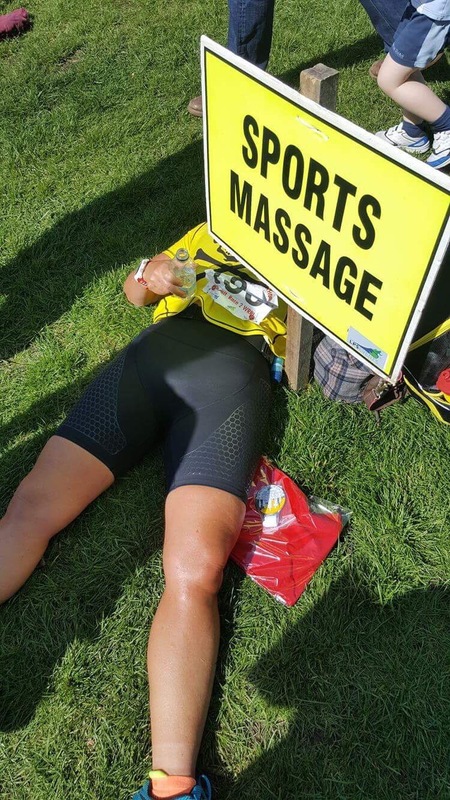 They had water, Jelly Babies and Beer – things were looking up 🍺 I tried to borrow a bike to get to the finish but they were having nothing of it, only 4 miles to go they said cheerly ! What ?? you must be mistaken. The 2:45 pacer appeared and I thought ‘thats it I’m really having a bad day in the running shoes’. But she said she was a bit ahead of schedule to accommodate the big hill to come – not what I wanted to hear. So I ran off a head of her while she was hydrating. I managed to get some steady consistent and a controlled pace for the next couple of miles, enjoying the sunshine and scenery. Mile 11 water station I was greeted by Carrie who walked in flip flops up the off road gravel trail with me. This was unexpected – the hill in a bad way and the company in a good way. After comparing tans and having a selfie Carrie sent me on my way down the last mile to the finish as she collected water bottles. By slowing down and keeping it steady I crept over the finish line after the 2:30 pacer & his unicorn entourage but ahead of the 2:45 pacer. Well outside my estimated finish range but over the line on my own two feet and not in the ambulance that came in a few minutes before me and worrying my friends especially as they’d passed me on course not feeling to great. 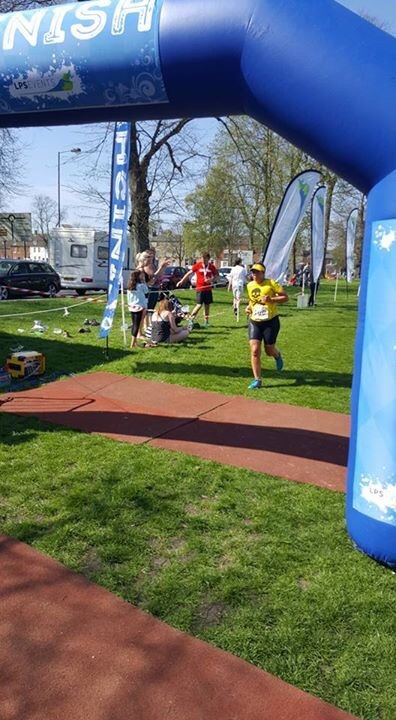 I made the mistake of going off too fast but ultimately it was the environment & exercise, asthma & hayfever that won on the day – but I hung in and used my ability not to quit to complete the race. A Sunday roast dinner that we booked at a local pub soon revived me. The others suffered in the heat and were all about 15 minutes off their planned times. I don’t think it was the sunshine that was my issue as I was fne in Hawaii half, but at least i got to top my tan up ! Monday morning – right asthma & hay fever I’m not letting you ruin my events. I called the asthma nurse and explained what had happened in the race and that the hay fever tablets I was on didn’t seem to be effective ( I’ve suspected this before as they don’t seem to last 24 hours). The nurse referred me to the Doctor and she said that as I’m still in my first ‘green’ year of asthma they will treat asthma & hayfever separately. Also as I’m still responding well to Ventolin as and when needed and in my spirometry test Dr prescribed a prescription only stronger antihistamine saying they will constantly review the asthma & medication, but is trial and testing to find the balance. Also added a steroid nasal spray to be used when exercising outdoors. So the daily routine now is – inhale, swallow, sniff and breath. Will test the new drugs on Friday in 10 miler and Monday Sportive Hopefully they will provide some relief. Two deliveries 📦 due today that should improve my health & fitness. Well done! You won. And if something bites you in the bum, bite it back. You will get it sorted out, the air is polleny enough to even set me off at the mo, and I don’t have hay fever. I agree with miscykw. You won, Zoe. You persisted. You completed when you had a perfect excuse to go “nope, I can’t do this”. And you never, ever gave up. As always, I am impressed by your achievement. Thanks Greer – I do have a don’t quit attitude however bad I feel It may come back and bite me in the bum one day ! I do not bet, but I would bet that attitude helps to fuel your great success. I disagree. I don’t think Asthma won. I think you won.